Taste test: These are dark yellow tortilla chips with a brownish flavor powder on them. When you first bite into your first chip, the immediate taste is OK. I think that might just be an immediate reaction to any tortilla chip with salt on it, because the good taste doesn't last long. As you start to chew, the flavor gets worse as it starts to taste sort of like dirt, or seaweed, or something like that. It's not super-awful or anything, but it's just not very appetizing. 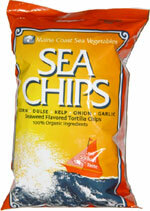 One of our tasters said the chips "taste like low tide." Smell test: Smell kind of like seaweed, but not that awful. One guy said they smell like his cat. Company: Maine Coast Sea Vegetables Inc. 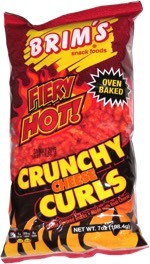 This snack was discovered by Mary at Roo's Natural Foods, Johnson, Vermont. Review published .